Argument 7: God is the best explanation of the connection between the flourishing of the kinds of moral agents there are, and the necessary moral truths that apply to them. Not only do we have beings to which necessary moral truths apply, but we have beings that are made up in such a way that doing what is right turns out to be good for them, it contributes to their flourishing rather than their languishing. Maybe only one in ten universes that are moral, in that they have the right sorts of beings that are such that moral goodness, and the flourishing of those beings involved, converge. The last sentence is virtually meaningless, but the emphasis here on necessary moral truths is bizarre. I’m not sure what they are, but I’m certain that I haven’t the slightest interest in the concept. Vandergriff spoke earlier of the prohibition against murder as being a necessary moral truth, but many Christians are in favour of capital punishment, which is murder by the state. The murder of Bin Laden a couple of years ago raised very little moral outrage, nor does the murder of hostage-takers and other terrorists today. So these are apparently moral prohibitions that are on some occasions more ‘necessary’ than others. I find the pretence of surprise that acting on ‘necessary moral truths’ seems coincidentally to promote human flourishing to be ridiculous and thoroughly disingenuous. The fact is that we’ve promoted human flourishing through social evolution. One of the most comprehensive explanations of how this has been achieved is presented by Steven Pinker in The better angels of our nature, a work of empiricism, not philosophy. Pinker has no more interest in ‘necessary moral truths’ than I do, he is concerned to explain how some human populations, and an increasing proportion of them, have been able to learn from the destructive errors of the past and to build better legal, economic, political, social, health and education systems, to better balance co-operation and competition, and individual and social goods. His analysis owes nothing to ‘necessity’, everything to the lessons learned through bitter and often traumatic experience. There are no perfect systems, but polities can be improved grindingly through continued analysis and experiment based on hard-won knowledge. Vandergriff and Ganssle put the cart before the horse. We flourish because the systems we put in place are designed for our flourishing. Yes, horror of horrors, our morality is all about enlightened self-interest, not ‘necessary goodness’. The horrors of the Great War drove us to attempt, for the first time in history, an organisation of international co-operation. Its dissolution was a setback rather than a complete failure. The later United Nations, with all its failings, has gradually grown in strength and will continue to be a force for peace, together with other international and intergovernmental organisations. The success of Medicins sans frontieres has spawned similar organisations ‘without borders’, and the trend is likely to continue. People get enormous satisfaction from helping others. Selfish satisfaction? Yes, but that vastly oversimplifies the matter. It is above all the satisfaction of being connected, which is so important for perhaps the most social species on the planet. And our increasing knowledge of our connections with other species is expanding our circle of sympathy, as philosopher Peter Singer has eloquently pointed out. But as you might be able to detect, my sympathy with these arguments is starting to run out, and it gets worse. 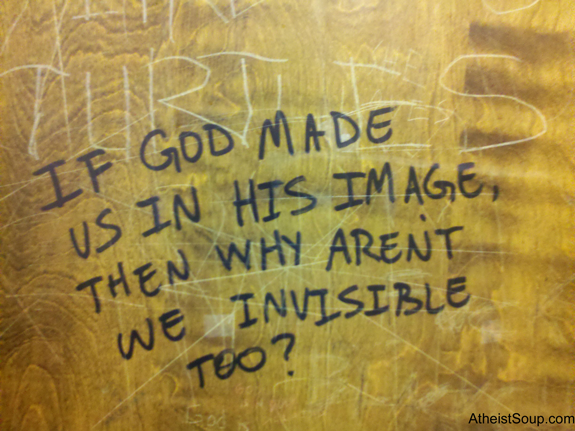 Argument 8: God is the best explanation of why there are self-aware beings. It should be pointed out that supernatural beings of any kind (let alone the mass-murdering war-god of the Old Testament) are always massively problematic ‘explanations’ because they have no empirical foundation. These are abstract objects, in spite of their variously imagined ‘histories’ in innumerable sacred texts. The development of self-awareness in many species on our planet is a contingent empirical fact. When we discover evident indications of a definite plan, upon which all these modifications have been regulated by a few simple and universal laws, our wonder is as much excited at the inconceivable wisdom and goodness of the SUPREME by whom these myriads of beings have been created and are now preserved, as at the mental blindness and perverted understanding of those philosophers, falsely so called, who would persuade us, that even Man, the last and best of created things, is too insignificant for the special care of Omnipotence. We readily forgive these dated claims, partly because they don’t directly challenge us any more, bit it seems clear that many theists have learned nothing and forgotten nothing over the centuries. There are many obvious problems with this way of thinking, but the one I find most indigestible is that in order to avoid the horrors of contingency, which, certainly in the case of William Lane Craig, is the greatest and most unacceptable horror of all, theists are still forced to conclude that everything – the possibly-infinite multiverse, the big bang, quasars, black holes, dark matter and dark energy, gravity, quantum mechanics, the laws of nature, the elements and their proportions etc etc – was created by their god for us. We, containing so many of the god’s qualities, albeit in infinitesimal proportions, are the fulfilment of his purpose. We are what he created it all for. Not a geocentric universe perhaps, but an anthropocentric one for sure, with a complexity that the god gradually reveals to us as our privilege to work out. So theism here presents us with a choice, or so it believes: total meaninglessness, or the humbling knowledge that we are central to a god’s plan, the pinnacle of his creation, created in his image, fumbling caretakers of his multiverse. As fantasies go, it’s a whopper. From an empiricist perspective however, it’s a non-starter, except in psychological terms. It has helped our forebears to get through many dark nights of history. I’ll dispense quickly with Vandergriff’s last two arguments. Argument 10, God is the best explanation for the worthwhileness of life, is just more of the same and requires no further analysis. Argument 9, probably the most preposterous of all the arguments, is that ‘God is the best explanation of the historical facts about Jesus of Nazareth’. There are no historically established facts about Jesus of Nazareth, even of his birth, his preaching, his trial and his death, let alone of his putative miracles and resurrection. Scholars may argue to and fro about these matters, but their arguments are entirely textual and have no serious empirical value. Okay, I’m done with this. Never again, I hope.